YG copper(brass) zipper slider assembly machine is for high quality YG slider making.High efficient and easy to operate. 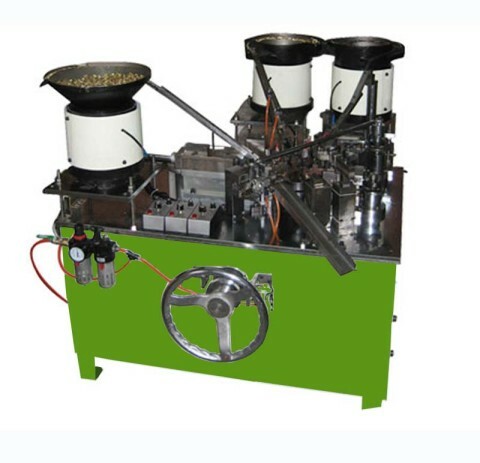 Auto zipper slider assembly machine for YG kind slider is used to produce copper (brass) YG slider as picture. Full automatic machine save labor cost and improve slider quality. The machine is controlled by PLC,steady work and high effecience. This brass YG zipper slider assembly machine is the good instead of pressing by manual machines or by hand. Adopt imported eletric and air parts. Precise spare parts are produced by advanced manufacturing equipments. YG zipper slider making machine is easy to operate and low fault. YG zipper slider producing process is: zipper body and puller(pull tab) by auto punching machine as same way to produce spring by different punching mold.Then use YG slider assembly machine to finish.Easy process for good product compared with other kinds sliders. 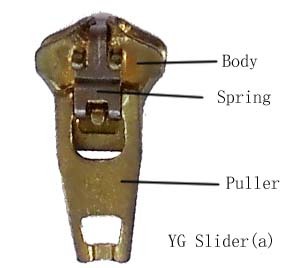 In the market,brass YG slider price is more higher than zinc alloy material zipper slider.